For this session I worked with a couple of big pups who will only get bigger. Penelope (left) is a eight-month-old Newfoundland who steals flip flops, jumps up, pulls on the leash and drinks out of the kitchen sink. 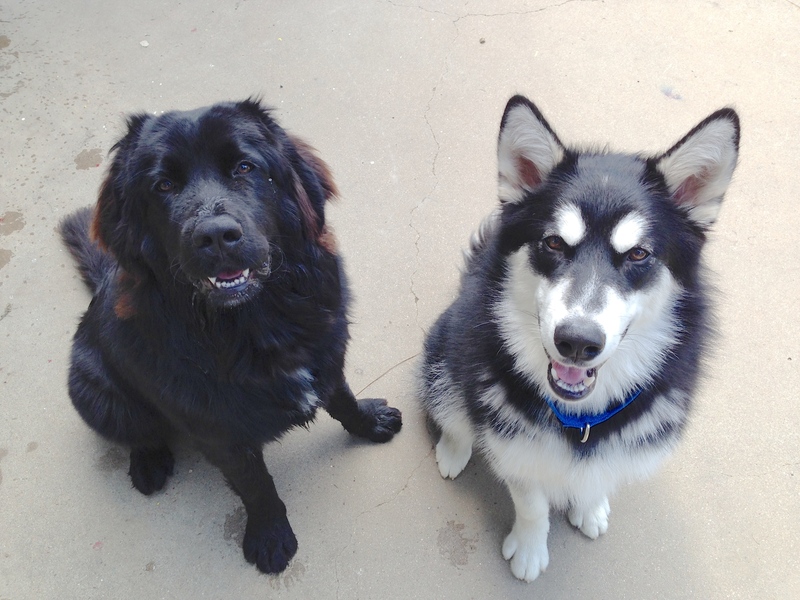 Her partner in crime is Bear (right) a eight-month-old Malamute who also steals flip flops, pulls on the leash and jumps up on people. When I arrived for the session, both dogs got excited and showed little control. Their guardians said that was par for the course and why the dogs are rarely allowed upstairs. I projected a confident, assertive stance and blocked or disagreed with them when they tried to jump up on me or invade my personal space. Owing to their breeds, Bear was more invasive and was the one who tried to claim me. I applied a special technique I have developed to stop a dog from jumping up. After applying it once, Bear vocalized his disapproval as only a Malamute can. I tried not to chuckle as it was a pretty cute sound, a cross between a howl and a yodel. While he clearly didn’t like the way I corrected him, it certainly did the trick as he didn’t try to jump up on me or anyone else for the rest of the session. I set some simple rules and boundaries then communicated them to the dog using body language and movement. Within about twenty minutes, both dogs were calm and behaving. Their guardians told me they had never seen the dogs that calm. But really all I did was disagree with their over-exictement and tell them how I wanted them to behave. Because the family has three children, I knew I needed to help the dogs learn how to control themselves and respect the personal space of the humans so I showed the family the leadership exercise I developed a few years ago. I ran through the exercise with Bear a few times until he seemed to understand the rules. The only hang up he had was at the end when I gave him permission to get a high value meat treat I had dropped on the floor. But once I incorporated a coaxing hand motion, he got the right idea. Next I walked the father of the family through the exercise with Bear. His timing and technique were spot on which was reflected in how quickly Bear laid down to communicate he knew he couldn’t get the treat without permission. After a second successful repetition, I had the mother take over. Because she is petite and her initial timing was a bit slow, the dog tried to go around and through her to get to the treat. But she stuck with it and was able to block the Malamute and back him down. I ran all the members of the family through the exercise including their four-year-old daughter. Mastering this exercise will help the dogs learn self control while it teaches the humans how to lead and correct their dog in a way that earns them its respect. To help stop the dogs from knocking the children down, I went through a simple recall exercise. I showed them how to use a hand motion at the end to place the dogs into a sit. The more the dogs sit in front of the children and get a reward delivered in a positive reinforcing way, the more apt they are to repeat that pose in the future. With enough practice, the dogs will start to sit down in front of a human to get a reward (treat or attention). I finished the session up by showing the family how to add rules and structure to meal time. To dogs, eating is a primally important activity. By having dominion over this, we can really elevate how the dogs see and respect us. The video below is probably the most in depth view I have ever posted on the website. By the end of the session, the dogs were far calmer; listening to the commands and corrections of all the members of the family and respecting their personal space. These are two little puppies in giant bodies. Because the family has learned how to communicate and lead the dogs in a way they understand, most of the problems these dogs have will stop pretty quickly.